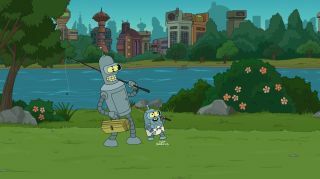 Bender and his son go fishing in this scene from the first episode of the seventh season of "Futurama." The animated sci-fi series "Futurama" kicks off its seventh season Wednesday (June 20) with two back-to-back episodes. The show centers on the life of Philip J. Fry, a 25-year-old pizza delivery boy who accidentally freezes himself on New Year's Eve in 1999 and wakes up 1,000 years later. He finds work at an intergalactic delivery company called Planet Express, where he meets an odd crew that includes the 160-year-old Professor Hubert J. Farnsworth, the comely lady cyclops Leela, a foulmouthed robot called Bender and an incompetent doctor named Zoidberg, who happens to be a lobster-like creature. The fact that "Futurama" is still around for a seventh season is a testament to the persistence of its creators and the devotion of its hard-core fans. The series first aired in 1999, was effectively cancelled in 2003, came back as a set of four direct-to-video movies beginning in 2007, and was finally picked up by Comedy Central shortly thereafter. SPACE.com: What can we expect from this new season? What can we look forward to? Billy West: Bender has an illegitimate son with a soda machine, which is pretty groovy in and of itself. And Fry and Leela get closer than they've ever been before — it's up to your imagination. It's always a tease, but it's kind of fun to see where this whole thing is going after all this time. It's kind of a cliffhanger/suspense thing with those two. You never know. SPACE.com: Who are some of the guest stars this season? West: Wanda Sykes is going to be starring. And George Takei, and Dan Castellaneta from "The Simpsons," and Patrick Stewart. And Estelle Harris — you know her. These are just fun — a lot of fun things coming up. The premiere episode is called "The Bots and the Bees," and, like I told you, it's about the office beverage machine. And then there's a second episode that will be premiering that night, rounding it out to an hour of new "Futurama," called "A Farewell to Arms," in which an ancient prophecy predicts the world will end in the year 3012. In the second episode of Futurama's seventh season, an ancient prophecy predicts the world will end in 3012. SPACE.com: That's pretty topical, with some doomsayers talking about the Mayan calendar's supposed prediction of the apocalypse coming this December. SPACE.com: You voice a lot of characters on the show. Who's your favorite? West: You know, there's really no favorite. Whatever the favorite is is the one that I'm doing at the moment, because I think they're all just such rich, fun characters to play with. You can really get into acting out those characters. To me, they seem real. SPACE.com: They seem real to a lot of us watching, too. And we've started to care about them, which is odd, because they're cartoons. West: That's the great thing. It even goes beyond that — there's a real tear-jerker coming up. Those are the ones they throw in that, it potentially has the power to evoke an emotion in you where you feel like you're misting up, or you're actually going to cry because you relate to it in some way. To me, that's monumental. I mean, when did a cartoon ever do that? SPACE.com: A lot of space science is discussed on the show. Do you consider yourself a space geek at all? West: I did when I was very, very young. I was in love with the planets; I was in love with the past's idea of the future, now that I look back. That's the most clever view of the future, like the stuff they used to write about and draw in the 1940s and '50s, you know what I mean? They had these great drawings of specially designed gravity boots and all kinds of stuff, and contraptions that you'd wear, and the craft they'd fly in. There was so much beautiful graphic art, when everybody's imagination was going wild, because that future was unwritten. And then in '69, there was a couple of guys bouncing around [on the moon] that looked like an X-ray. I like the romanticized and really, really future-forward sort of sci-fi. I was a huge sci-fi fan when I was a kid. I had a telescope, I read books on planets. The fact that we've discovered all this stuff in the wake of that — new planets, all kinds of things. SPACE.com: Yeah, scientists have discovered thousands of potential alien planets out there in the past few years. It makes your imagination run a little wild, thinking about what's out there. SPACE.com: People are still fighting about that. A lot of people get really emotional about Pluto's demotion. West: Oh, I know. I would've been the same way when I was a kid; I was so into it. And I was a geek. I mean, I was the only one in the area that had comic books. There might be a kid a mile away who had a comic book. "I heard there's this kid that has a comic book; I've got to walk there, say hi." I just resent the fact that it's cool now to be a nerd. It was not cool 50 years ago. Forget it — it was you against the world. Nobody wanted anything to do with somebody who lives in a daydream world. SPACE.com: What do you think has changed? Why is it cool now to be a nerd? West: My theory is that people have found out that everything they taught you in school will give you little or no help in life. I mean, look at the future that was supposed to be: you could get a job, work your way up, join a good union and get respectable wages that had graduations in it, and get benefits. That was the American dream. For everybody who was good in math and history and science and English and social studies and all that — there's no jobs. They're all gone. They're totally gone, so everything they prepared you for was almost for nothing. I hate to say it, but the things that I do today have nothing, absolutely nothing, to do with things I learned in school. But that's just me. I was a freak, and you pay dearly for that early on. SPACE.com: What's it like to know that so many people care so much about the show? "Futurama" has such a devoted following. West: Oh, I know. I want to thank every single one of them, and if I could I would in person, for bringing the show back. Because that's what brought the show back — we couldn't do much about it. SPACE.com: You guys did well in syndication, and people watched the movies. That's what convinced them to give you another shot — that there's this huge fan base out there, right? West: Yeah, but that was prodded on by a singular force, which was the people who love the show on the Internet. In their mind, it was too good to not be on television. And that they actually had serious feelings about it, and they weren't going to be denied. That's what it looked like to me. I thank everybody involved in that, because it was a big deal. SPACE.com: How has working on "Futurama" compared to the other shows you've been a part of [which include "Ren & Stimpy" and "Doug"]? West: It was so enjoyable, all the sessions. For the most part, I don't think I ever had a bad session, or a bad table read. I mean, the laughter just heals everything. And I'm sort of spoiled. I came from the [Howard] Stern show, and that was like a comedy fountain; it was like you'd go out of there, and your ribs would be hurting from laughing. And it was what we did. We were just playing to each other and having a good time. And "Futurama," I get the same thrill out of it twice a week, once at the table read and once at the record. SPACE.com: Is it safe to say you'll be with the show for as long as it's on? West: Of course, yeah. I never get sick of it. I'd like to create some shows, which I'm working on now, but nothing tops what I've been doing with "Futurama." I mean, it's so fulfilling on so many levels. And to enjoy it, I've got to compartmentalize. I can't sit there and get all caught up in the fact that I'm sitting there listening to myself. I just pretend that I have nothing to do with it, so I can enjoy it like anybody else. Because I'll sit in judgment of everything I did, and it'll be a miserable experience. SPACE.com: You have so many different voices, and a lot of them sound very different than your normal speaking voice. When you hear yourself onscreen, does it sometimes not sound like you? West: You know what it is? I'm at the point — and I have been for a quite a long, long time — where I believe those characters. They seem very, very real to me, and suddenly I lose my disbelief. It becomes like everybody else; you're supposed to have a suspension of disbelief. SPACE.com: How will "Futurama" be remembered, do you think? When it's all said and done, will the show rank up there with the sci-fi greats, like "Star Trek?" West: Oh, I don't know. In another 25 years, whatever media has been pioneered, I'm sure it'll be existing out there somewhere. It'll outlive me, let's put it that way.